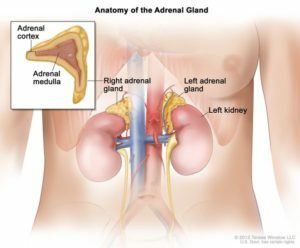 Figure 1 – Anatomy of the adrenal glands. Familial hyperaldosteronism is a group of inherited conditions in which the adrenal glands produce excess of the hormone called aldosterone. Aldosterone helps control the amount of salt retained by the kidneys. When aldosterone is in excess, more salt than normal is retained by the kidneys. This causes high blood pressure (hypertension) by increasing the body’s fluid levels. Familial hyperaldosteronism type I (HALD1): it is also known as glucocorticoid-remediable aldosteronism (GRA) as it can be treated with glucocorticoids. In familial hyperaldosteronism type I, hypertension ranges from mild to severe and generally appears from childhood to early adulthood. Familial hyperaldosteronism type II (HALD2): it does not improve with glucocorticoids and hypertension usually appears in early to middle adulthood. Familial hyperaldosteronism type III (HALD3): in most individuals with this type, the adrenal glands are enlarged. Hypertension starts in childhood and is rarely treatable, leading to early damage in heart and kidneys. Hyperaldosteronism, familial, type IV (HALD4): in this form hypertension onset is in childhood (before 10 years of age), with no apparent adrenal mass or hyperplasia at the time of presentation. Familial hyperaldosteronism is inherited in an autosomal dominant pattern. Hypertension, which may lead to cardiac problems (frequently characterized by left ventricular hypertrophy and diastolic dysfunction), as well as neurologic, retinal, and renal problems. Hypokalemia – which may cause fatigue, headaches, muscle weakness, cramping, and palpitations. Polyuria and polydipsia from hypokalemia-induced nephrogenic diabetes insipidus. Altered insulin and leptin secretion. Cardiovascular fibrosis, directly related to aldosterone hypersecretion. The prevalence of familial hyperaldosteronism is unknown. Familial hyperaldosteronism type II appears to be the most common form. All types of familial hyperaldosteronism combined account altogether for fewer than 1 out of 10 cases of hyperaldosteronism, since most cases of hyperaldosteronism are not genetic. HALD1 or glucocorticoid-remediable aldosteronism (GRA) is caused by the chimeric gene CYP11B1/CYP11B2 caused by an anti-Lepore-type gene fusion. The CYP11B1 gene provides instructions for making 11-beta-hydroxylase, which helps produce corticosterone and cortisol. The CYP11B2 gene provides instructions for making aldosterone synthase, which helps produce aldosterone. When these two genes are abnormally fused together, too much aldosterone synthase is produced. This overproduction causes the adrenal glands to secrete aldosterone in excess. HALD2 is caused by mutations in the CLCN2 gene which encodes a voltage-gated chloride channel with high expression in the adrenal glomerulosa. HALD3 is caused by mutations in the KCNJ5 gene. This gene provides instructions for making the potassium channel. Mutations in this gene result in the production of less selective potassium channels, allowing other ions to pass as well. The abnormal ion flow leads to increased aldosterone production. HALD4 is caused by mutation in the CACNA1H gene. Congenital adrenal hyperplasia, due to 11-beta-hydroxylase deficiency (CYP11B1 gene mutations), of which diagnosis should be considered in patients with features of hyperandrogenism and hypertension of the mineralocorticoid-excess type. Glucocorticoid resistance (NR3C1 gene mutations), which is characterized by hypoglycemia, hypertension, and metabolic alkalosis. Hypertension, early-onset, autosomal dominant, with exacerbation in pregnancy (NR3C2 gene gain-of- function mutations). The Ser810Leu (S810L) mutation is a gain-of-function mutation which results in early onset hypertension in men and gestational hypertension in women. Patients respond to amiloride administration. Apparent mineralocorticoid excess (HSD11B2 gene mutations), which is form of low-renin hypertension associated with metabolic alkalosis, hypernatremia, and hypokalemia, but low aldosterone. Liddle syndrome, (SCNN1B or SCNN1G gene mutations), in which patients may present with hypertension and hypokalemia early in life. There is also a condition called primary aldosteronism, seizures, and neurologic abnormalities (CACNA1D gene mutations). This syndrome is characterized by hypertension, hypokalemia, plus other features such as generalized seizures, cerebral palsy, spasticity, intellectual disability, and developmental delay. Given the genetic heterogeneity, it is highly recommended to proceed to a multigene panel, possibly based on whole exome or whole genome sequencing, integrating gene sequencing with a targeted molecular approach for the detection of the chimeric gene CYP11B1/CYP11B2. Posted in Academia, Disease cards, Last Update, Medical Genetics and tagged CACNA1D, CACNA1H, CLCN2, CYP11B1, CYP11B1/CYP11B2 fusion gene, HSD11B2, hyperaldosteronism, KCNJ5, NR3C1, NR3C2, SCNN1B, SCNN1G.